Tourists and friends often ask me what is it that makes Cambodia so attractive to the many expats like me who have relocated here. Firstly, I have a great love for the Kingdom of Cambodia, there’s a sense that anything can happen here and the best things in Phnom Penh are free. The beautiful scenic backdrops of the wide Parisian, tree-lined boulevards, the water and light displays that take place nightly at Independence Monument, a stroll down the picturesque Riverside, through the city’s parks and temples, encountering friendly local faces at every turn. Within a few months of arriving in the country I already felt at home socially and had surrounded myself with close friends, both local and expat, with continual invitations to engagements, weddings, nights out on the town and dinners with groups of people at popular barbecue restaurants on the weekends. Secondly, and more practically, Cambodia offers the best value for money of any country in the region. The very first apartment I rented only cost a mere $270 a month and was located in one of the best neighbourhoods in Phnom Penh. It had one bedroom, one bathroom, a modern kitchen, large living room and a nice little balcony filled with lush tropical plants. Electricity rarely cost more than $100 a month, even with non-stop air-con, Pay TV was just $6.50, water was $6.50 and garbage collection only $2.50, all payable monthly. Mobile phone calls cost a fraction of what they do in Australia although I mainly use Skype to make my calls for free. Internet access is pretty good with many expats relying on their smartphone to stay connected. $1.35 will get you 1GB of mobile data, many people also spend around $20 a month for an additional unlimited WiFi home connection available from multiple suppliers. My grocery bill runs to around $250 every month. It’s possible to spend a good deal less, but for that bit extra I can enjoy high quality imported goods from America, Australia and Europe, as well as organic fruit and vegetables from the local market. When it comes to eating out, variety is the spice of life here. Local restaurants are the best place to grab breakfast which invariably includes grilled pork, steamed rice and pickled vegetables. This is the staple breakfast dish of Cambodia and costs as little as $2.50—best enjoyed with an ice coffee. I am spoiled for choice for lunch and dinner options as Phnom Penh is home to well over 100 great restaurants catering to almost every nationality and taste. For example, you can get an outstanding three-course meal with wine for $30 at Ocean restaurant, which specialises in fantastic seafood and steak, or for those on a more limited budget you can get a great Pulled Pork Burger at Lonestar Saloon, with a drink, for under $10. The quality and standard of entertainment is rapidly expanding and advancing in Phnom Penh. The city boasts some pretty outstanding shopping centres featuring well-known franchised retail and food outlets, including Burger King, Starbucks, Gloria Jeans Coffee and many more. There’s also ice-skating rinks, and 4DX cinemas—which feature special environmental effects—where tickets go for as little as $5.50 a person. If you like to spend your free time working out in the gym, full membership at a place with modern equipment, air-con, steam rooms and a swimming pool will set you back $68 a month, but, as ever, there are cheaper alternatives available. Cambodia offers an impressive lifestyle on a limited budget but its real appeal lies in the place and its people. 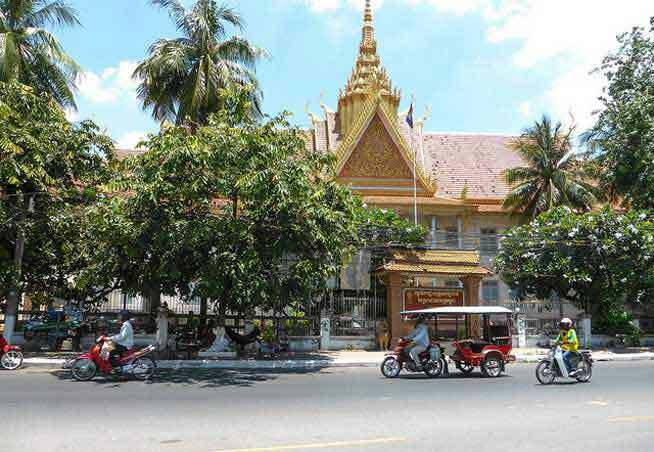 Phnom Penh is known as the “Charming City” for many a good reason. After years of living here I’m still as charmed as the day I arrived.